Gifted Bay Area musicians Jennie and Mark Walstrom played beautiful Swedish music at Nordic House in support of their recently released CD Skåda Uppå Liljorna. Jennie has an amazing clear and beautiful voice. both play nyckelharpa, and Mark plays a number of other instruments including sackpipa (Swedish bagpipes), mandolin and guitar. 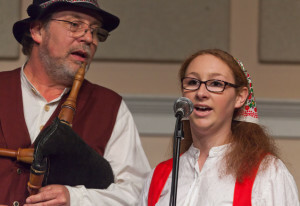 Their music magically transports you back in time to a Swedish countryside, perhaps to dance at the edge of a forest. Once in Sweden, their magic continues and between the songs and Mark’s introduction of them, you get to meet famous musicians, recall unrequited love and learn about Swedish culture. 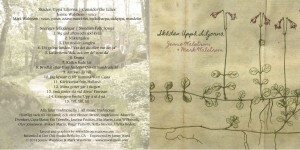 Check www.mwalstrom.com for possible shows or to purchase the CD. This CD is way cheaper than a trip to Sweden and much easier to manage than time-travel. Skål! Crayfest was a HUGE hit!